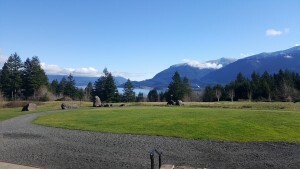 Early in February, several River Rats — Christina Shintani, Christina Appleby, Pat McDowell and Matthew Goslin — attended the 15th annual River Restoration Northwest Symposium at Skamania Lodge in the Columbia River Gorge. Christina Shintani and Pat McDowell both gave presentations about applications of Structure from Motion techniques for restoration monitoring. Christina Appleby, in addition to presenting a poster on her work in the Long Tom River, was one of the select few student volunteers facilitating the event. Attending each of the past 3 years, the symposium is a unique event which has become one of my favorites (Matthew G). Why do I like it so much? 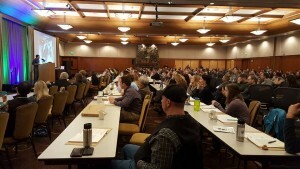 The symposium brings together several hundred people from diverse professional backgrounds — engineers, planners, policy folks and scientists from biologists to hydrologists — representing a diversity of entities — private environmental consulting and engineering firms, local to federal agencies, tribes, universities, non-profits — all of whom are motivated by their passion for rivers. The symposium eschews multiple concurrent sessions for one single session in which everyone participates — stretching everyone with talks that may not be in their area of expertise, but in so doing bringing everyone together into the same conversation. While the focal region is the Pacific Northwest, the symposium’s quality is increasingly attracting participants from throughout the West as well as farther afield, including a couple talks from Scotland this year. Highlights for me this year were featured talks by Matt Kondolf (UC Berkeley), “Erodible Corridors: Where Possible in Theory, Examples in Practice,” and Steward Rood (U. Lethbridge), “Functional Flows: A Practical Strategy for Healthy River” and a session on “Nature’s Ecological River Restorers” that exemplified the increasing recognition of biological and geomorphological linkages. The symposium also allows ample time for socializing, meals together and networking, including a young professionals luncheon in which the UO students participated. Each year, I find this event refreshing, perhaps because many talks focus not just on the critical science of understanding the damage that has been done to ecosystems, but also on figuring out methods and strategies to effect positive change and restoration for river systems, lessons learned and success stories. Furthermore, in the context of our country’s contentious elections just getting underway, I was struck by stories of collaboration, efforts to talk across differences and bridge gaps between different stakeholder groups for the purpose of finding common ground around rivers. Perhaps river restoration practitioners understand better than most that we are indeed all connected and need to persist in efforts to work together, rivers make that connection an inescapable fact.